Superabsorbent Doggy Bag keeps your pet, car and home spotless after a walk. They don’t just absorb ten times more water, but sand and mud too! 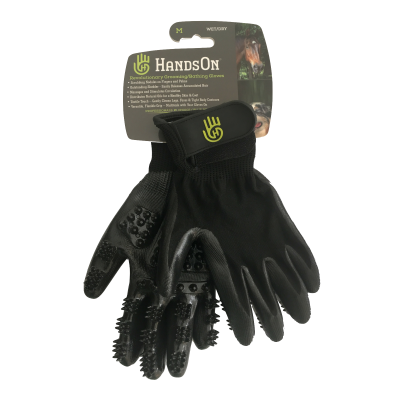 Made from a premium heavy duty microfibre material, makes it more durable and longer lasting than a cotton towel. 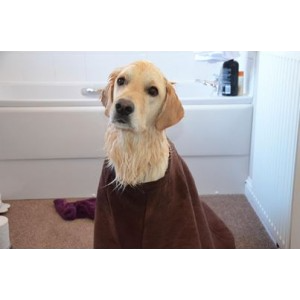 Leave it in the car, zip your pooch up and your best friend will be dry before you get home! I just purchased one of your bags at a local dog show, and I just love it. And it really does work. I have a Lagotto, with a long curly coat which attracts dirt, sand and mud. He just loves to dig in sand and swim at the beach, river or lakes. Now my car stays clean. My dog is dry and the sand and mud just drops off into the bottom of the bag. No puddles, no more dirty sandy towels dropping sand everywhere in the car. Its great and super absorbent. Best $99 I have spent in a long time. I bought one of these at the Sydney Easter show and it is brilliant. I have a long haired dog who took 2 bath towels to dry her properly. I used the Doggy Bag for the first time after her bath and after rubbing her in it for literally a few minutes she was practically completely dry. Also when she shakes herself I don’t have water going all over the bathroom as it’s kept in the bag. Any loose hair stayed in the bag too and then I just took it outside and shook it and dried it on the clothes line. It dries quickly too which is another plus. Although the bag is quite expensive it definitely works so it was worth the outlay for me. I plan on getting another one to keep in the car. Late this afternoon we took the dogs to the park for a run. Quinn convinced Dora it would be fun if they went for a swim in the creek and off they went. Dora went swimming but Quinn didn’t. 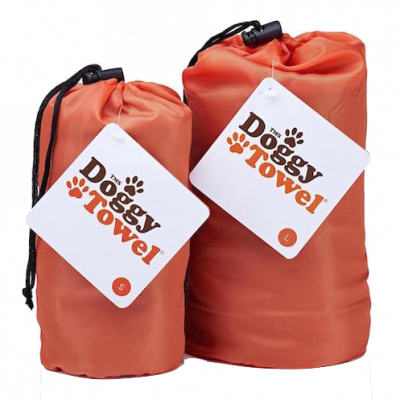 Once we got home we discovered just how quick & easy it is to dry our dogs with our Doggy Bag – what a great product. Dora also discovered something – don’t believe everything Quinn tells you! Originally I bought my Doggy Bag to support a friend but I really didn’t see how they would work. Well I still don’t know exactly how it works but my baby border collie is a “water baby” but combines the water with mud. The first time I used the Doggy Bag I zipped a muddy, dirty, wet and protesting dog into the bag and once in the bag could not go anywhere so I was in complete control and rubbed then unzipped the bag to magically find a dry clean dog who was no longer protesting. I only wish I had two pairs of hands and a camera so I could have taken a before and after shot. This dog no longer protests about getting in the bag but simply stands in the middle while I Velcro the neck then simply zip, rub and presto like magic out comes my loveable clean dog. Since buying my bag I was so impressed that I have also bought another bag for a friend as a gift. I am involved in retrieving trials with my Golden Retrievers. At these trial we always have a water run and it’s usually the last run of the day. 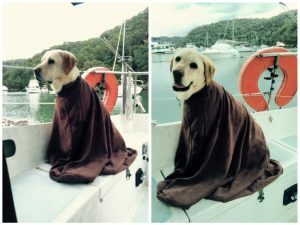 It’s difficult to get a Golden dry in cold weather in the middle of winter. Daytime temperatures sometimes in single figures and night time temperatures are in the minuses. Read the information regarding the “Doggy Bag”, heard the sales pitch and immediately bought the bag. Our next trial would be the perfect time to try it out. After her water run Dancer came back wet and luckily not too dirty. I put the open bag onto the ground and had Dancer sit in the middle then followed a few minutes of cuddles, patting and rubbing. I was amazed at how dry she was at the end and the bag still had enough drying power to do a friends flat coat retriever. So quick and easy and fun for the dog. Dancer and I love the “Doggy Bag” – she for the cuddle/play time and me because I no longer have to worry about having a wet, muddy dog in the car overnight. I know she is dry, clean and especially warm. The bag itself dries quickly spread over the car bonnet in the sun – another plus. I couldn’t be more pleased with my “Doggy Bag”. I currently compete in retrieving trials with my golden retriever Rebel. During the trials & also during training we frequently do water work in dams, creeks, rivers, etc. Therefore Rebel is continually getting wet & dirty. I used to carry a lot of towels in the car to dry him off. By the end of the day or the weekend I would have a pile of wet smelly towels to take home and wash. Since buying my “Doggy Bag” I no longer need a pile of towels and I no longer have all that washing. My process at the completion of the water work is to allow Rebel to shake off the huge amount of water on him, let him run around for 1 to 2 minutes to generate some body heat, I then put him in the Doggy Bag, give him a good rub over, leave him in it for a few minutes, then Rebel is clean and dry. I then hang the Doggy Bag out to dry in the breeze and we are ready to do it all again. Love my “Doggy Bag” and I wouldn’t be without it. Used the XL doggy bag on my maremma puppy today following his bath. He’s was extremely comfortable using it & he was dry in minutes. Thank you so much for such a great product. Might need 1 for my show cats. Dora aka Australian Neuter Champion Tapua Honey Gem CDX NRA is one very busy pup. She lives near the seaside on Sydney’s northern beaches and has at least two wet weekly outings to get salty and sandy – add to that a bit of sweat and saliva … then you have a pretty messy mutt. Her other favourite new activity is Retrieval Trialling in the Dogs NSW competitions held out of town in the bush or farmland where muddy creeks and dams are integral to the pursuit of the game. However Dora does have a cleaner image to maintain in the championship show ring, the obedience trials and for her work in front of the advertisers’ camera (as Kleenex Puppy, Optus spokesdog, Supercoat model). Not only does the Doggy Bag keep Dora looking smart and shiny for these occasions but it ensures that my car stays free of dirt and dog hair. If I spread the bag and lay it out inside the boot she jumps onto it and is zipped up in seconds. By the time we get home she is magically dry and clean. I simply unzip, she leaps out of the car and I hang the bag up to dry. After a quick shake it is ready to use again. Used the bag yesterday. Brilliant. My dog hates the blow dryers at dog washes. Had a bit of trouble getting her to stay still in the bag while I did it up, but it’s something new and she was unsure. I’m sure she’ll get used to it. Rubbed her all over, and, hey presto, dry happy dog emerged from the bag. Can’t recommend enough. Thanks Doggy Bag Australia. Dear Doggy Bag Australia, thank you for your product it is awesome. I take my dog for a walk to the Bega river 4 mornings a week. She runs in the river and then the dry sand and comes home horrible. I have tried jackets that get wet and yuck, I have tried towels that don’t get the sand off and your bag means that the sand comes off, she is dry and she doesn’t come home and jump on beds and furniture and put sand everywhere. I love your product and just wanted to let you know!